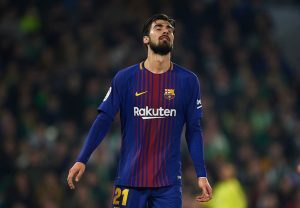 According to the reports from Spanish media outlet Sport, Barcelona will be willing to sell midfielder Andre Gomes in the summer and Everton are said to be best placed to sign the midfielder. However, the report adds that an unidentified club is also in the mix to sign the Portuguese international. Now the club’s name isn’t mentioned in the report, but after some digging, we can confirm that the other interested party is Inter Milan. Albert Roge, a writer from Sport, confirmed this news on his Twitter account. Everton are said to be willing to pay between €25-30 for their on-loan star, and we expect them to sign the midfielder in the summer transfer window. Everton though are having an underwhelming season as a lot was expected out of Marco Silva when he was appointed in the summer. Moreover, he was backed heavily by the board and the Toffees made headlines with some big signings like Yerry Mina, Richarlison, Luca Digne, Kurt Zouma and Gomes. They have shown some moments of brilliance during the season, but Silva needs to get consistency in his side. At one point, the pressure was immense on the Portuguese manager as Everton were going through a bad run of form and there were even talks of him getting the sack. But after a few positive results, he is likely to continue for the next season as well. Anyway, the club needs some stability as the Toffees had sacked the likes of Ronald Koeman and Sam Allardyce not too long ago. Barcelona signed the midfielder from Valencia for £29.3m, and one can understand how highly the Catalan giants rated him. However, it has become clear that the midfielder isn’t going to make the cut with the La Liga holders after a dismal season and one can understand why they would be willing to ship him away in the summer. The interest from Inter Milan can make things interesting even though the English club is the favourite to sign this 25-year-old midfielder right now. Milan are placed third in Serie A right now, and if they manage to maintain that position until the end of the season, then they would get an entry into the Champions League. Therefore playing in Europe’s elite competition might lure the midfielder to Italy and Everton can lose out on the Portuguese star. So as of now, the news regarding Milan joining the race to sign the midfielder is definitely a worrying sign for the English club. Tottenham Hotspur Favourites To Land Barcelona Mis-Fit: Is He Really What They Need? 3 PL Clubs Who Should Sign This Wantaway Barcelona Star Including The Defending PL Champions! Everton Want To Sign Portuguese Midfielder On A Permanent Basis: A No Brainer For Silva? Manchester United Line Up Move For 24 Y/O Portuguese Midfielder: Do They Really Need Them?